Affirmation: I am focused. I see, sense, feel, and know the truth. I follow my intuition. It is easy for me to meditate. My entourage of angels orchestrates my life. I receive messages all the time and follow my internal guidance system. Sage wisdom is innate within me. 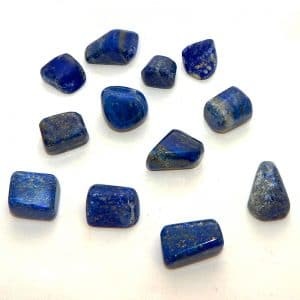 About the stone: Lapis lazuli is considered a rock because it is composed of several minerals including hauynite, sodalite, noselite, and lazurite along with the presence of calcite and pyrite. 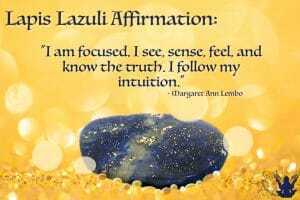 Spiritual uses: Lapis lazuli opens the third eye and the intuitive senses when used with conscious intent. 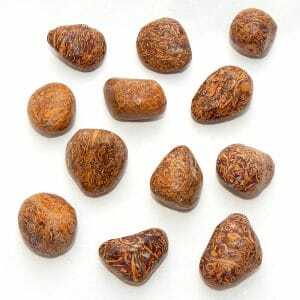 This is a good stone to help you remember your dreams and promote clarity during dreamtime. 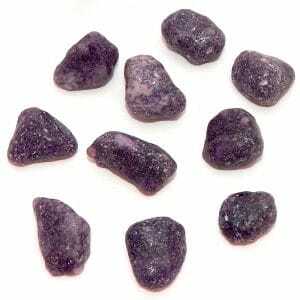 Use this stone to channel the Other Side, for mediumship, and to access the Akashic Records. Mental uses: Lapis lazuli is a grounding stone that helps you to focus your attention on your studies. Emotional uses: The deep blue vibration of lapis lazuli calms feelings of frustration, agitation, and anger. 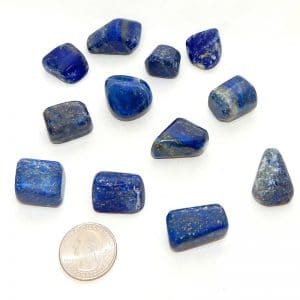 Physical uses: Like all stones that carry dark-blue energy, lapis lazuli can assist in calming inflammations.